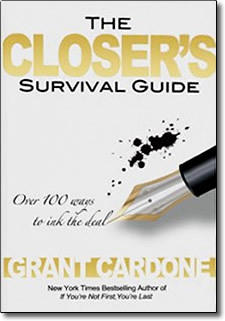 Closer’s Survival Guide – paperback by Grant Cardone – Discount! The Close is 20% of your selling time but 100% of your income. The Closer’s Survival Guide contains 126 of the most powerful closes known to mankind guaranteed to make you a Master Closer. In each of these jam-packed discs, Grant personally delivers each close with his usual flare and style while also giving you the secrets to fully utilize each close so that any objection can be handled quickly and effectively. With The Closer’s Survival Guide, you’ll be able to shut the deal down each time, every time. It’s up to you, either Close or Be Closed.